Mahbubur Rahman,Toys watching toys. 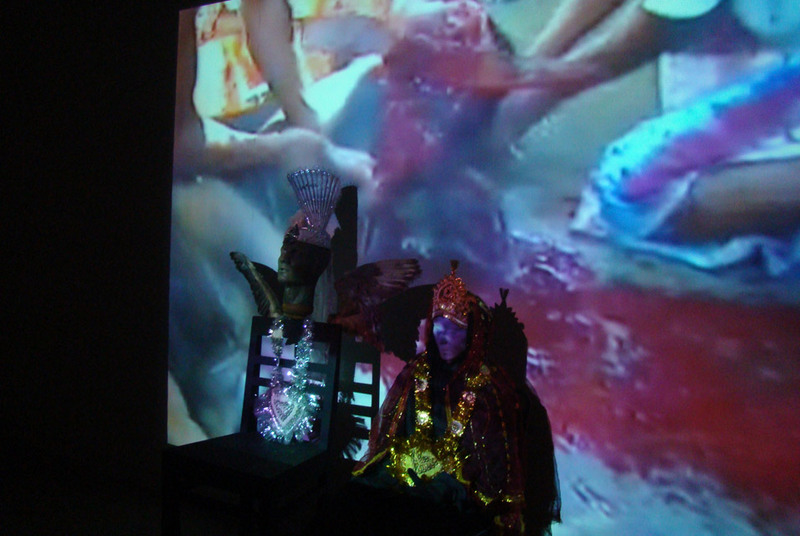 Video projection, glass fiber, borkha, chairs, duck wings,wedding costume, size variable,2002. DHAKA.- The inaugural edition of the Dhaka Art Summit will take place next month from 12-15 April 2012 in Dhaka, Bangladesh. The Dhaka Art Summit is the first large scale public showcase of art in Bangladesh, and a pioneering public-private collaboration in the country. The summit is organized by the Samdani Art Foundation , a non-profit arts funding and development organization in collaboration with the Bangladesh National Museum, Bangladesh Shilpakala Academy (the national fine and performing arts school of Bangladesh), and sponsored by American Express. The Dhaka Art Summit was created as a platform for the development of artists in Bangladesh, and to create awareness about Bangladeshi art internationally. It offers galleries and independent artists without gallery representation in Bangladesh an opportunity to showcase their work, free of cost, to the general public and influential museums, curators, galleries, collectors and press from across the world. Nadia Samdani (Founder and Director, Dhaka Art Summit and Trustee, Samdani Art Foundation) said in keeping with the foundations long term commitment to developing infrastructure for art in Bangladesh, the Dhaka Art Summit is focused on increasing public awareness about art within Bangladesh; it is also an initiative to increase dialogue between art communities in the region, and access to South Asian art internationally. Later in the year, and following the Dhaka Art Summit, the Samdani Art Foundation will take an exhibition of South Asian art to New Delhi and London.